There is a Greek word that many of us have not yet met (until now); but so many people, all Christians for that matter, have eaten a meal by it or through it. How is that? The Messiah spoke Aramaic, not Greek. His name in Greek is Iesous and Jesus in English; but we rarely call Him by His native-tongue’s name Yeshua or Yashuah. Language has a way of determining how our thoughts are formed and, it follows, how we lead our lives. In many cases, this is a result of 3 main contributing-factors: environment, culture and education. Where we grow up, what we grow up with and how we make use of our gifts and abilities, also determine how we relate with our Creator, whether we acknowledge Him or not, and with our fellow humans. Without desiring it, Yeshua (let us get used to that name, in the meantime) brought about all the confusion about this Greek word, anamnesis, which we hope to unravel here. 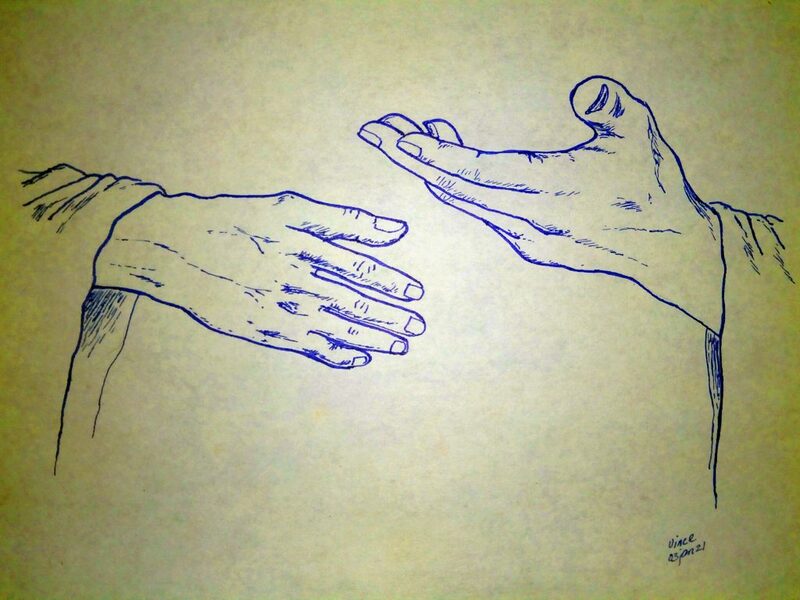 Anamnesis means “a remembrance, recalling or bringing back to mind”. In essence, the root verb anamneis denotes “to think of” or “to put to mind”; it then involves a “thinking of” or “putting to mind” something or someone. In these few innocent-looking possible meanings of the word has revolved the most overlooked and unappreciated teaching, as well as the most prevalent and worst translation error being peddled among believers within the past two millennia. You might wonder whether this discussion is making a big thing out of a small thing – semantics, nothing more. For how can a small word bring about what we have described above? We will explain; and you can judge for yourself. In Luke 22:19, Yeshua took bread and gave it to His disciples, saying, “This is My body which is given for you; do this in remembrance (anamesis) of Me.” This has been the most commonly-accepted translation and teaching that has been propagated by most theologians and Christian groups. Hence, today, people have been led to believe and accept that Yeshua left us a special memorial in His honor. By that, we refer to a specific ceremony, rite or act that is apart from what we as humans normally do. But did He? So in like manner, did Yeshua turn the ordinary meal into a memorial with all the special meanings and purposes we have incorporated into it today? Or did He intend to use the regular meal (and keep it as it is) as a venue for us to attain something that is, first, a natural result of God’s loving provisions and, second, an extraordinary gift derived from a perfect divine plan? That in doing so, we do honor Him (as we should with our whole life); but, more so, we acknowledge what He had and has done for us – not just giving us satisfying and delicious food (as a normal meal should be and not just mere crumbs) but also making us partake of the spiritual harvest of God, which is eternal life through faith in Yeshua the Messiah? In short, the act of doing or eating (“do this”) becomes a necessary part of very act of thinking of Yeshua (much like the “walk” becoming part of the “prayer”) and not just a means. As simple and as direct as that! Yes, we can think of Him at any time and without the meal; but we would not be fulfilling the command without the act of eating a real meal. But how come the whole thing has brought about so much confusion and controversy? Is this Yeshua’s desire or a result of human bungling? Does all the centuries-old diversity a necessary and an inescapable feature of unity among believers? Or do we merely compromise because we know no better way of doing it? Is there hope for a true spiritual unity for believers? There must be. Unknown to so many, there is an alternative meaning which we would like to present as a better and, if not, the only right teaching that Yeshua meant for us to understand and practice. And that is He meant for us to “think of Him” through the many things He left us as pictures or pointers to His mighty deeds as Creator and Savior. Oftentimes, the Luke passage above is taken only as an isolated statement totally dedicated or confined to His death and suffering, as well as His resurrection, and not as a blanket truth encompassing all that He had ever done from the very beginning of time, He is doing at the present and He will do in Eternity. For as wonderful and amazing as His resurrection was and as important as it is to us, it forms but a part of His entire being, image and work as Eternal God Who has always been alive. Is that not what and how we should think of Him continually? And more so when we “do” what He asked as precisely to do in order to fulfill that purpose? However, when people quote Luke 22:19, they often only think of His death on the tree and of His burial. Sure, they do take the natural step toward acknowledging His resurrection, His ascension to Heaven and so many other deeds of His. Nevertheless, the statement (and the so-called memorial derived and developed from it) as gleaned from the context of the last Passover and His death right after that, can never be taken out of the minds and practices of most believers in their “remembrance of His death”. Take a close look at that phrase “remembrance of His death”. In that phrase, we see the evolution of the mistranslation of the word anamnesis. Let us clarify. When Yeshua, in essence, said “do this to remember Me” (as many understand it), He was still alive and, in fact, feeding His apostles. He acted as the party’s host since He Himself arranged the whole thing with the owner of the upper-room — not to mention telling Moses, way back then, to keep the Feast of the Passover. We think He was merely a regular Jew participating in the yearly celebration of their ancestors’ escape from Egypt? Think again! Yeshua was the promised Messiah. All the laws that Moses commanded came from Him. No, the whole of Creation came into existence through Him. And so, at that Passover moment, He was speaking, first, as Creator and, second, as would-be Savior and King. Yes, He was telling the disciples, in hidden words, He was “giving His body” (the bread He gave — still digesting this?) to them. That alone removes the wrong notion that we should “eat the bread” to “remember His death”, because He was still alive. If there is anything to “remember” about Yeshua, it is that He created everything and that He reigns in Heaven, ruling over Heaven, Earth and the Universe. Can you now see how we have mistranslated the verse? Yes, you may argue that He did mean to use the bread as a symbol of His death. Not necessarily. He is not and never will be the Bread of Death but the Bread of Life. Passover was just half of the metaphor Yeshua was using. Just as Moses sacrificed the lamb to save the Israelites from the angel of death and from Pharaoh, Yeshua offered His life to fulfill the Father’s demand. Yeshua is also the Lamb of God, as pictured by the year-old lamb they ate on the same last Passover meal. So, why did He not use the lamb as His symbol of His sacrificial offering? The answer explains the confusion further. The lamb signified the necessary payment for sin demanded by the wrath of God. Never will the blood of sheep and bulls satisfy divine wrath against human rebellion since the beginning. Only Yeshua’s pure blood or life-offering can. That symbolic Paschal Lamb was a metaphor of Yeshua’s pure offering of His life, fulfilled on Calvary. As the Lamb of God, He effectively carried all the sins of the world. Through His death, the power of sin was removed. Yet, He was now establishing a new covenant (the old covenant was fulfilled and rendered finished through His death). And He was now using bread and wine to point to that covenant. The new covenant He hinted at (during the last Passover) was going to be also fulfilled in the Kingdom. In Matthew 26:27-29, Yeshua took the cup and gave to His disciples, saying, “Drink from it all of you. For this is My blood of the new covenant which is shed for many for the remission of sins. But I say to you, I will not drink of this fruit of the vine from now on until that day when I drink it new with you in My Father’s kingdom.” Note also that of the bread, Yeshua said in Luke 22:16, “I will no longer eat of it until it is fulfilled in the kingdom of God.” In short, the bread and the wine were to be fulfilled, completed or perfected in the Kingdom He was going to establish after His work on Earth would have been finished and He would have reigned in Heaven – that is, as King over His kingdom. What else could it be? Do we have to wait for Him still? No need. He reigns now; and we are either in or still outside of that Kingdom. Yeshua’s command then to “do this” was not a short-sighted plan for us to consider only His death soon right after the last Passover but a long-term — no, eternal – plan pointing to His resurrection, His ascension and His reign as Almighty King. We “think of” Yeshua as He is, while praising Him for what He had done and is doing for us. We take Him and partake of His whole Being (through eating) and not just a piece or crumb (certainly not just the morbid, suffering human flesh-and-blood “memory”) of Him. When were the bread and wine then fulfilled then? After Yeshua resurrected and during the Feast of the Firstfruits or Pentecost Day, when the two loaves of the Bread of the Firstfruits were offered by the Jews at the temple through the priests. (Lev, 23:17) When they ate bread that day, they became the fulfillment of that law of Moses, as Yeshua promised. And guess what they ate. Not the unleavened bread of Passover but the leavened bread of Pentecost Day. Two prophetic metaphors were fulfilled on one and the same day in a single simple meal or agape (love-feast), again, as Yeshua promised. The bread fulfilled by the Body of believers (the Kingdom He came to establish) and the wine by the Holy Spirit poured on them as Yeshua’s gift through faith and obedience: Bread, His Body on Earth today; wine, the Blood or Life of the Spirit flowing in that Body. Do we see then how anamnesis takes on a more encompassing idea so contrary to and so dismissive of the beliefs and practices of many today? And do we now see that the meaning “to think”, not “to remember or recall”, is the more appropriate and right idea we must entertain and promote, for Yeshua remains alive, just as He was yesterday, today and forever. 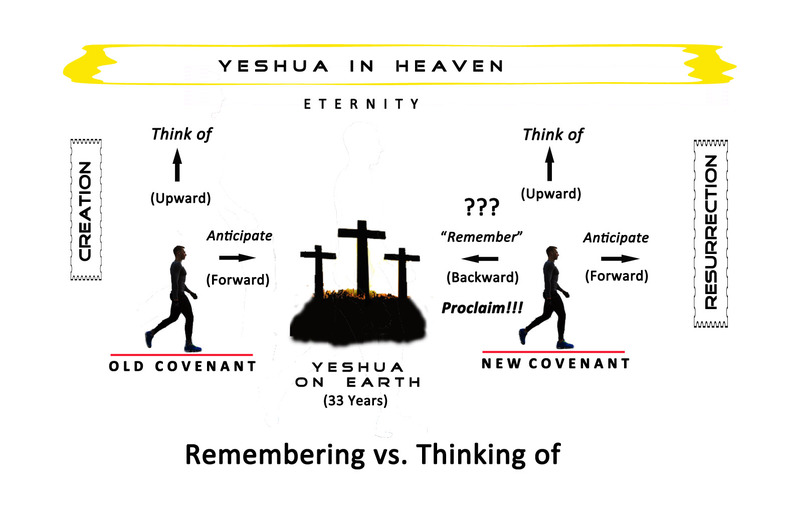 Yes, we think of a present reality (that Yeshua is alive and reigning in Heaven) and do not mainly “remember His death”. The command given to the disciples, in truth, was to “proclaim His death” (I Cor. 11:26). Do we see a command to “remember His death”? Unless you were a true eyewitness, how can you do so? If so, there was no memorial established or required — only a spiritual connection between God and individual humans made possible by the power of God through the Holy Spirit. The command given was to simply witness to the world and to others that Yeshua did die and that He did so to save us (as a proof of one’s faith, as well as a way to share that truth, but definitely not as a requirement to satisfy any ritual or sacrament). Since it is a finished or accomplished deed, why dwell on it any longer as if we were required to celebrate, reenact and revive the horrific details of His sufferings? Did He tell any of His disciples to do that? Did any of them practice that? No, only the Jews kept their Passover Feast as Jews, still awaiting the Messiah. In reality, the apostles, in trying to win the Jews, merely submitted to that old practice as a religious accommodation. On the contrary, the disciples had their agapes in their homes which used ordinary food and not the staple Passover bread. Those agapes were common meals distinct and separate from the Passover meals. And that is where many people today get sidetracked because of teachings that lead them away from the historical record. Read again and note where the writers used specifically Passover Feast (a Jewish-based rite) or agape (or breaking bread, that is, eating a simple meal as practiced by the early believers). Messianic Jews or Judaizing Christians tend to mix concepts; and many believers are often taken for a wild ride. Formal gatherings often require people to undergo a ritual or ceremony as a way to set order or to shepherd people along the path they have determined according to their denominational pattern. However, in the infancy of the Kingdom, such things were unheard of. The Way, as it was labeled then, was a lived-faith and a real-life offering of believers living in submission to the guidance of the Holy Spirit. Forget about fancy expensive buildings, elaborate rites and extraneous requirements meant to help us express effectively how we must give honor and glory to Yeshua. And along with those, a modern priesthood which revived the ancient priesthood, thus, completing the “remembrance” that has prevailed. Have you ever thought how “remembering” has become the most expensive and also the most lucrative, if not the most human-indulging activity? How many national official and religious holidays do we have? Not counting the many regional, local and, of course, personal days to remember (town fiestas, wedding anniversaries, birthdays, death anniversaries and so many others). Add to those the many statues, art works, relics, buildings and memorial sites used to attract pilgrims and tourists, all for the purpose of, yes, remembering the narratives which any poor person can visit in the mind and spirit through mere reading of scriptures. In many cases, they end up worshiping or idolizing the physical objects as well. You see, remembering is good business; but it is a very dangerous practice. It diverts, deceives and destroys. Among the many memorials ever set up, Holy Week stands as the ultimate source for perpetuating the most misguided anamnesis of all. (Christmas is a close second.) The Eucharist, Mass or the Worship Service merely replicates the memorial in a much more subdued manner. That is how it all started and where it will all hang for a long, long time to come. The Jews, by their nature, keep the Passover, having rejected the Messiah. In taking over (literally, at times) the role of the apostles, many religious leaders kept the basic form of the Passover and turned it into a Christianized feast or commemoration (remembrance) done regularly, daily, weekly or annually. The simple rule to keep in mind – alright, to remember — is that there nothing to recall, only so many things and blessings to celebrate at the moment. Yeshua looks down upon us from Heaven. He thinks of us in ways we can never comprehend. He knows us more than we can know ourselves. He knew us even before we were born. And He knows how we feel right now. He certainly knows whether we truly serve or worship Him with our mind, heart, soul and spirit. He also sees how we use our body to honor (or dishonor) Him. As our God, He has the desire and the right to look over us. He does all these things in real-time. In the now. This very moment. And in the next . . . and the next . . . . So, why do we keep “remembering”Him at the very time which He Himself prayed He never had to go through – His agony and death? Think of Him! As He is! Where He is! In Heaven! Why do we make it hard for ourselves and others? Worship God in spirit and in truth. Not in Jerusalem, nor in Samaria, nor in Rome, nor in Manila, nor anywhere else. As we are, where we are upon the Earth, think of the living and reigning Yeshua while anticipating eagerly His return! Is that so hard to do? Finally, when we do obey His command in the Kingdom, He will come and eat with us. Did you ever eat with someone while reminding him how he had died a cruel death? On the contrary, He comes in order to accompany us and minister to us in our own sufferings and our own impending death. How can we remain in darkness for so long by denying His goodness? Those believers who died for their faith before Yeshua came, looked forward to His coming. Those who died after He had triumphed and ascended, looked up to Him and forward to His return. (Read how Stephen, the first Christian-martyr died while seeing Yeshua arising from His throne in Heaven, appearing to welcome him instead of taking immediate revenge on His enemies.) We, the living, may choose to look back, to remember or to commemorate whether in moments of joy or pain. But at the moment of death, will anyone still think of Yeshua bleeding in Calvary? Or dead? But is that not what many priests today do to those who approach death – feed the dying with the supposed true flesh and blood of the dying Yeshua? Moreover, is that not what many also feed the living, not just literally but figuratively? Seeing so many people in that situation, one way or another, it comes as a great wonder for me. I can only stop thinking at this point.